This entry was posted on Monday, March 30th, 2009 at 8:47 pm	and is filed under Best practices, Mapping, Mountain Carto, Promote, scripting, Software. You can follow any responses to this entry through the RSS 2.0 feed. Both comments and pings are currently closed. This sounds great, but I can’t seem to get the link to work. @ Patrick: All the links work for me, what one are you having problems with? Nice work Nathaniel – the simplify / generalization issue has constantly been a thorn in my side wrt contour (isolines in general) – your script is very timely. Thanks for putting it out to the masses. I’m glad that people are eager to try out my script. I’m open to suggestions on how to make it more generally usable. 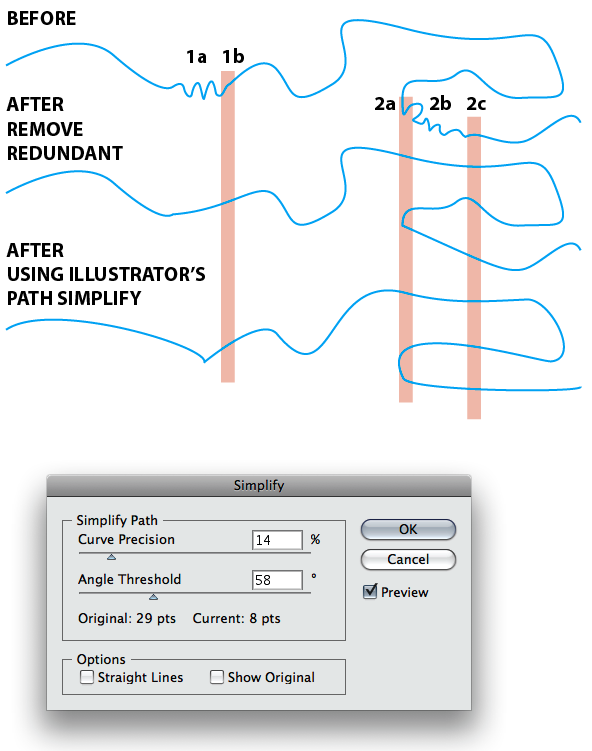 As Nathaniel says, when I started, I had no idea that it might prove more generally useful than to help with the dreaded duplicate point problems in CS3 (and I guess CS4) that plague such commands as Object->Path->Outline Stroke, Object->Path->Offset Path, Expand, etc. Right now the script keeps only the leading point (lowest index on the path) and copies the direction handle from the trailing point to that leading point. This works fairly well so long as the points are reasonably close together, but as the example above shows, it leads to distortions as the distance between the first and last point grows relative to the overall path geometry. After reading Nathaniel’s writeup, and looking at the referred link to Douglas-Peucker, I’d say that the script could pretty easily be adapted to use such an algorithm as an alternative. I’ll see if I can’t find some time to try to code that in (warning, however, my April has some deadlines, so it might be a bit). 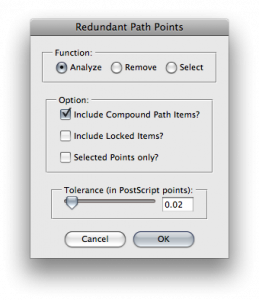 I added options to control position of remaining point on removal. The new choices are to keep the leading or trailing point, or to average the position of the points. 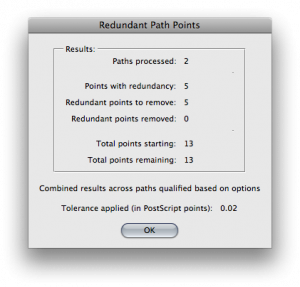 I also fixed bugs in docGetSelectedPaths(). CompoundPathItem objects don’t seem to to have properly formed pathItems arrays when they contain what appear to be groups of paths, so when certain compound path objects were selected, no paths were found. One last note, older versions of the script are available at the wiki by clicking on the file link and selecting the link for the date/time of an earlier version, which will download that version. Wow, Jim. Seriously life-saving stuff. We’re doing a big collaborative art project with alot CNC plywood work. The vector files that artists submit have to be prepped for the CNC machine and Offset Path is a necessity. The resulting files have been giving the CAM software fits because of the bug, and your java-script literally saved me tens to hundreds of hours of cleanup at a time when I cant afford it. Does anyone have a working link for this script? Maybe a mirror or something? I’ll dig up a copy on Sunday or Monday. Thanks in advance! …much appreciated!